This agreement breaks new ground in support of the international vision of two viable states at peace with each other, and represents substantial progress in resolving the outstanding security and economic issues between Sudan and South Sudan. However, almost five months later, the September agreements have yet to yield a peace dividend for the people of Sudan and South Sudan. The final status of Abyei remains in limbo, cross-border incursions continue unabated, oil production and export has not restarted, and every day 300 refugees fleeing the grave humanitarian crises in Sudan’s Two Areas cross into South Sudan. The nine cooperation agreements between Sudan and South Sudan represent the start, rather than the end, of the bilateral peace process. Instead of codifying agreed upon compromises, these agreements set out a framework for 17 committees and commissions tasked with building consensus around politically sensitive issues and eventually implementing a durable peace. As a consequence, these committees are now critical for forward progress on peace between the Sudans. Unfortunately, the government of Sudan has systematically sought to undermine the implementation of these agreements by advancing new preconditions and delaying the formation of these committees. Despite the excitement immediately following the presidents’ September 2012 agreements, much more work is necessary to secure a lasting peace. Addressing contentious issues through committees and commissions demands a high level of coordination between the Sudans and will require the expenditure of limited financial, technical, and personnel resources. Under the terms of the cooperation agreements, securing funding and logistical support for these committees and commissions is a precondition for implementation. 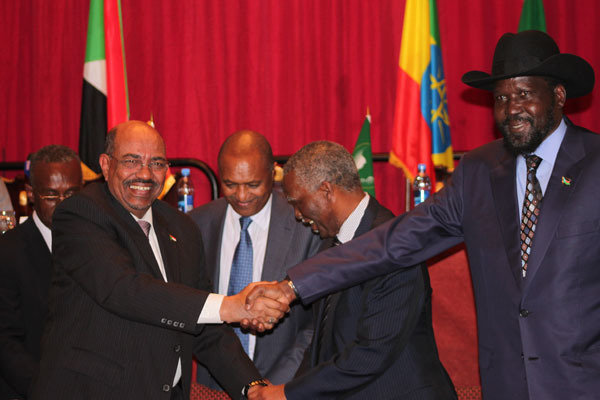 For example, even agreed upon parts of the international border between Sudan and South Sudan cannot be demarcated until the Joint Demarcation Committee and its subsid­iary Joint Technical Team are both established and adequately funded. In order to ensure timely and effective implementation of the September 2012 agreements, the international community must remain committed to the bilateral peace process, as they did with the 2005 Comprehensive Peace Agreement. A robust internationally supported monitoring mechanism to track compliance with the A.U. implementation matrix will be critical. In the coming weeks and months, these committees could serve as forums for meaningful and expedient progress on issues of strategic importance for sustained peace between the Sudans. However, financial, technical, and diplomatic support will be essential for ensuring that the 17 committees and commissions are more than legal shells. Read Enough’s newest briefing, Peace by Committee, and check out the chart detailing which bodies are responsible for addressing which outstanding issues between the two countries.